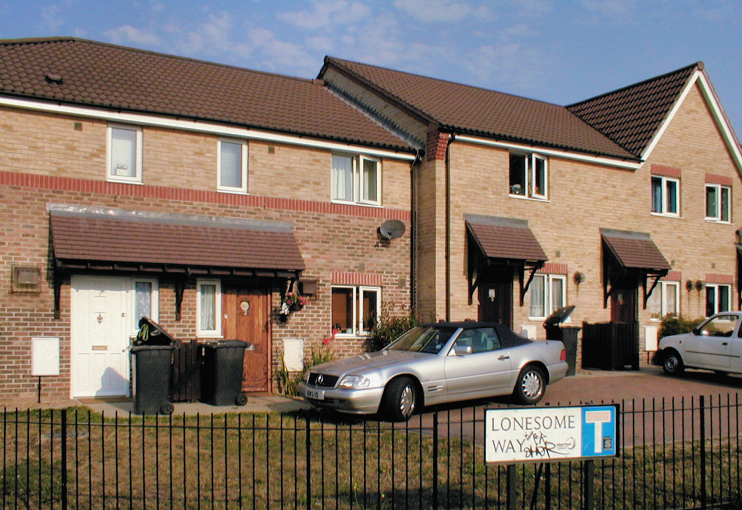 This locality is usually said to be named after a house called Lonesome, which stood roughly where Juniper Gardens is now. However, others have suggested that the house took its name from the place, which was so called by virtue of its isolation. Lonesome was once considered to extend quite some way towards Streatham, but the rise of Streatham Vale has shrunk it into obscurity. In the late 18th century Lonesome stood on the edge of the extensive lavender fields of Mitcham. Lonesome chemical works operated here in the second half of the 19th century, choosing this spot because of its sparse population. The works were located in the area now encom­passed by Rowan Crescent. 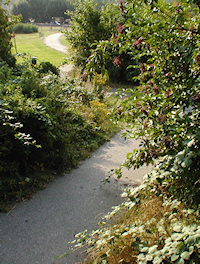 The coming of the railway and early indus­trial devel­opment in Streatham brought the first cluster of housing in the late 19th century, with residents fording the River Graveney on their walk to work along an uninhabited lane that has since become Streatham Vale. The early homes in Lonesome stood on the newly created Leonard, Lilian and Marian Roads, together with a row of cottages on what is now Ebenezer Walk. In the 1920s, before the building of Streatham Vale’s church of the Holy Redeemer, Lonesome’s Mission of the Good Shepherd was based in a large wooden shed off Marian Road and conducted open air evangelical work here. Lonesome is no longer an isolated spot, having been tightly built up in the second half of the 20th century, mostly in the form of cul-de-sacs. Many of Lonesome’s original dwellings survived until this phase of devel­opment. In the late 1970s Lambeth council created the Lonesome Depot gypsy and traveller site at the end of Lonesome Way. William Shelton MP said in 1981: “This gipsy site disgraces the borough. It is a burden and a disaster for the local community. If accounts are true, it is also the scene of bizarre and cruel happenings.” A council invest­ig­ation found no proof for these alleg­a­tions, though there were problems of rubbish and rats – and of social exclusion. Lonesome primary school is located on Grove Road. According to Ofsted’s October 2015 report, three-quarters of pupils are from a wide range of minority ethnic backgrounds and half the pupils speak English as an additional language. Both figures are well above average. The school was assessed as ‘good’. Tooting Graveney football club played at an enclosed ground at Lonesome from 1905 to 1907. They eventually became part of renowned non-leaguers Tooting and Mitcham FC.